"God is not on the side of the big battalions,"
", but of the best shots." It turned out that I needed a British Army Sniper for the Top Malo House scenario in the Force on Forcerulebook. Not having one to hand - I cast about for a suitable replacement. As it happened the British Army were still using a variant Lee-Enfield in the early eighties, so with the addition of a bit of greenstuff, aCeasar Second World War British Commando sniper became a Falklands/Cold War era sniper. I generally shy away from this sort of thing, but it would have taken so long to order an additional figure, it seemed ludicrous to wait. Unlike Ross, I can't simply make off with the lead from the Church roof and ramble home to cast up some extra hussars. Outfitting him in a ghillie suit seemed a bit silly, so I added a non-regulation camouflage cape and scrim on the rifle. Snipers are a law unto themselves at the best of times and while the cape has a rather Soviet look about it, it will do for the time being. I regret now that I didn't score the scrim on the rifle a bit more or take a picture of the back of the hood, which I was quite happy with. I learned yesterday the faintly depressing news that Command & Colours: The Spanish Army has been delayed yet again. I console myself that Hat's rather splendid looking Spanish infantry are unlikely to be out by then anyway and that Gorman is no doubt already attempting to inflict some form of collective punishment on the local Chinese community. Little and often appears to be a good rule of thumb when trying to get modelling work done, so I've have been chipping away at my Cold War project, basing trees and finishing standard bearers for some Napoleonic units. These are both SHQ figures. There were some minor moulding issues with the Brunswickers sword, so I added some greenstuff to complete the blade. The Spanish chap came with a flagstaff, but I've learned from bitter experience that white metal flag staffs rarely survive very long so I've taken to replacing them with brass wire. I made a hash of drilling the Brunswickers hand and had to add some green stuff fingers to complete the job. The Spanish fellow presented no problem once I had cut the original flagstaff away. Mrs Kinch said that I was basically a mechanism for turning books and toy soldiers into happiness. I'm a mediocre painter and became I do most of my gaming in 1/72 I don't demand a lot of detail from my figures. However every so often I come across some figures that are so fine that they demand the attention of a skilled craftsman. As I've mentioned previously, I have some Falcata Spanish Infantry which I received from my pal John Cunningham. They're stunning sculpts and I knew that they were well beyond my meagre capacities. Enter Mr E - a long time devotee of Games Workshop and Iron Kingdoms miniatures, who recently got sense and is now building a force of mercenaries in 1/72 to shoot things in the Middle East. He paints beautifully and very generously offered to paint the Falcata figures for me. I decided that they should be the Irlanda, which fits my accidental theme of collecting Irish regiments in foreign service. The Irlanda were raised from Jacobites who travelled from Ireland to Spain after the Williamite Wars in the late 17th century. Though by the Napoleonic Wars, there were few Irishmen left in their ranks and most of the recruits were native Spaniards. You can read a little bit about themhere. They also served under Zayas at the Battle of Albuera in 1811 and were disbanded in 1815. To the best of my knowledge they were wearing shakos and overalls at Albuera, but you would have to be a very dull fellow indeed to hold that against them. In fact, I will stop wasting your time with prattling and let the pictures do the talking. Two more privates, they are just fantastic, aren't they? A grizzled veteran ready to lead a bayonet charge! I have two projects looming large at present - a large scale Napoleonics game and a LARP both of which are due to run in October. Blessed as I am with large amounts of free time, I've been taking a leisurely approach to both projects using the "not giving a damn" method. What I'm currently excited about is my little Cold War project, specifically the BAOR versus the Soviets around Hanover in the early Eighties. 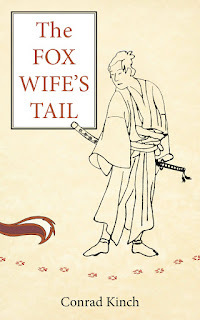 Naturally as there is no deadline associated with this project, it's the one I'm most interested in pressing on with. I don't know why, put it down to the natural contrariness of human nature, my own mercurial temperament or what have you. The figures are already bought, what is really exercising me at present is the question of terrain. Force on Force uses a small board, but typically takes place in a built up area so I shall have to make or buy some buildings. Many Cold War games that I have seen use buildings from the players Second World War collections and I'm not particularly interested in that. I was thinking about it last night and I've realised that what I really need to work on is. 1) One or two key buildings that tie the board down to a time and place. I was thinking a filling station and possibly bill boards, neither of which feature highly on Second World War boards. 2) Cars. Modern cities are build for the automobile. As Dashiell Hammet once wrote, "I bought a car so that I could read Los Angeles in the vernacular." This is not quite such an issue in Europe as it is in America, but the addition of several dozen toy cars of appropriate vintage would do a lot of the work for me. But that's not really what I wanted to write about in this post. I am old fashioned. I like corduroy. I smoke a pipe. I live in a house that was built in 1882. Mrs Kinch and I were married using the 1877 marriage service*. I like GA Henty, John Donne and Lady Butler. Mrs Kinch often refers to me as a "19th century boy" (see above). On the other hand, I live in the future - I go to work in composite body armour and carry a chemical weapon. I get most of my news from a pocket device, which I also use as a notebook and a camera. I correspond daily with people from different continents. I just finished playing a wargame with a Japanese who lives a world away. I am in some ways absolutely in tune with this lousy modern world. Last night, I started looking around googlemaps - trying to get a feel for the pattern of settlement around Hanover. I moved around the map and zoomed in and had a look around. I dropped a pin and tried to access Google Street View. I then discovered that I couldn't. I looked around and found that the German government had effectively knocked Google Streetview on the head. I was quite put out by this, I'm surprised in fact by how irritated I was. I am still astonished by the idea of flying, but I'm put out when I can't navigate the streets of a distant city on iPhone? My own expectations surprise me. * "I plight to thee my troth," I still smile whenever I read those words. I've been messing about with trees of late in an effort to dolly up my wargames table. With this in mind, I have embarked on a tree buying campaign*. This has bulked out my stock considerably and I think I've hit upon some good rules of thumb. 1. Differing heights. Previously my trees came in two sizes, now while the bulk of the woodland is still made up of these trees, the greater variation in the height is much more pleasing to the eye. 2. Differing types. I now have some birch as well as my more generic deciduous. I have aspirations to a weeping willow and an impressive oak, but they may be a while in coming. 3. Stick them close together. The smaller the base of the tree the more playing space you have left on the table. However, constantly picking up fallen foliage is disruptive as well. I'm using old Games Workshop 40mm bases because they are big enough to prevent even quite large trees from falling over, but small enough that it can rub elbows with an infantry unit in a five inch hex without too much difficulty. 4. Dolly up the bases. I have in times past stuck my trees to card bases with blu-tack. This is perfectly serviceable, but doesn't look very nice. On the subject of dollying up bases, I've found that it's an excellent way of going through old paint. The chaps above were glued to 40mm bases and then had a thin layer of filler smeared across them. This was roughed up a bit and small pieces of cat little pushed into it. This is then given a wash of watered down PVA to hold everything together. Here you can see some smaller trees which have been fixed two to a base. These fellows are at the next stage of the process. The chap on the left has been given a base coat of brown. I used to be quite particular about using GW Bestial Brown for this, but any old thing will do. I usually use whatever Vallejo comes closest to hand. Flat Brown and English uniform on this occasion, I believe. The base on the left has had a pebble added and has had a coat of what I've come to call "Constables Snow". This a heavy highlight of white, which breaks up the brown on the base. I don't know why it works but it does. Savage advised me to do this and he's a graphic design and knows whereof he speaks. Paint the roots to match the trunk, this is not always necessary, but the birches would look a little odd without it. And above, the finished product. These bases have had the "Constables Snow" treatment and then a few dabs of PVA and some static grass added. I've found less is more when using static grass as too much makes it look like you're on the ninth hole. You can use the grass to cover up any little slips where the white has been too heavily applied. The key thing to remember that that there is usually very little greenery beneath trees because they block out the light, so don't go overboard. I added a sprig of lichen for some colour and when some greenery fell of the chap on the right I just added it to the base with a dab of PVA. And the job is OXO. Oh and finally, a chap on the internet wanted a better shot of Rupert, the bear, not the chap, so here you are. Probably nipping inside to see if there is anything left in the wine cellar. *I did think about writing "...which has borne fruit." But I thought better of it. 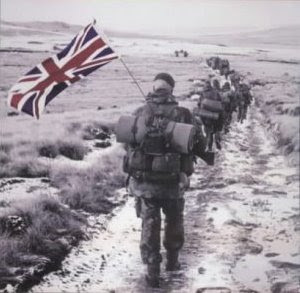 Digby's getup is based on this iconic image of the Falklands war. I'm still trying to find the correct attribution. Could you drop me a line if you know? Hmmm, is that fellow behind the window the section corporal? I've been painting Cold War figures for Force on Force, though I think the buildings are going to present more of a problem as you need quite a few of them. I'd like to do something specific to the period and not re-use my Second World War stuff. This is not an issue that is going to vex me much as I have bigger fish to fry. I have two projects due in October, a LARP based on Space 1889 by Frank Chadwick and a large scale Command & Colours: Napoleonics game with multiple players. These are projects that come with a deadline and I'm really going to have to get my finger out designing scenarios and adding polish to what is already a relatively good looking collection. It's been a while since I last posted, probably because I haven't had much to say. The last few weeks have been disappointing, personally and politically. Work has been by turns exhilarating and frustrating, but always exhausting. Poor old Mrs Kinch has broken her wrist and is in a bad way. But at the same time, Providence has been at work in myriad other ways and when I sat down to write this entry in something of a brown study, I began to count our blessings. The list is a long one and I won't bore you with, suffice to say that Mrs Kinch and I have a lot to be grateful for. Donogh and I played the C&C Napoleonics Scenario, The Combat at Redinha last week. This was a first outing for the British Grenadiers and Grenadier Guards and they were a credit to their corps. A full battle report to follow, but no doubt Donogh will beat me to the punch! I've taken an interest in Force on Force of late and I am nearly finished painting a platoon of British infantry for a Cold War/Falklands scenario. I've also picked up some Elheim Soviets, who look suitably dastardly. Unfortunately, I miscalculated and I shall have to add some extra chaps in order to play the first scenario in the book. I intend to use my small forces to play through most of the scenarios in the book, though this will mean that the Soviets will undergo sudden and dramatic changes in troops quality as they will be rated as "regulars" in one game and "irregulars" in the next. I imagine the Soviets in the latter case being something akin the "Volgs" from 2000AD. I've also decided that I need a plan for the rest of the year as idly picking at projects while fun isn't getting me anywhere. The last few days have been incredibly hectic and there's been damn little movement on the wargames front. However, I did pick up my paint brushes again and try my hand at painting Captain Rupert. His biography can be found here. Note the early model wood furniture SLR. And the famous bear and checked scarf can be see above. Not the most elegant sculpting job in the world, but passable for five minutes spent rolling blobs of greenstuff. The check scarf was done with a felt tip. And a shiny six pence to the bright boy who can tell me who Captain Rupert* is based on or at least heavily inspired by. *Disregarding the name which is a composite of two men who stay in the realm of the horse and musket like the sensible chaps they are.